With it first being released in the United Kingdom in 2016, Ben & Jerry decided it was time to rock some taste buds back in the States, too. What’s better than Ben and Jerry? That would be when a little bit of Bob is added, in the way of his One Love, which is the name of Ben & Jerry’s latest creation, Bob Marley ice cream. 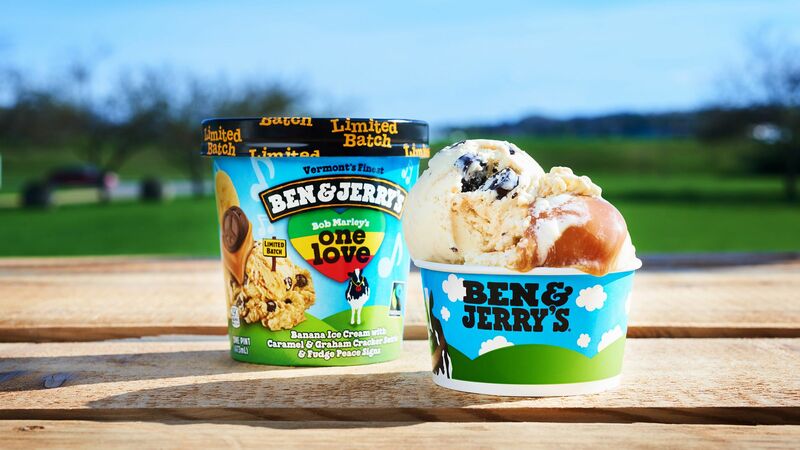 Yes, the gods of ice cream that are Ben & Jerry have released a flavor of ice cream named in honor of Bob Marley’s philosophy – and, yes, his song – One Love, which will soon be available across the entire country. We bring you this cool concoction as a tasty tribute to the legend that is Bob Marley, supporting his vision for a fairer world. In partnership with the Marley family, this flavor will help to fund a youth empowerment programme in Jamaica – music to your ears and your taste buds! We think that, just like ice cream, communities come in all kinds of flavors; and, together, we can make One Sweet World. Peace, Love & Ice Cream, from Ben & Jerry’s. But before you assume, no, there is no THC or CBD in the treat from “Vermont’s Finest” that is dedicated to Jamaica’s finest (musician, that is), which means it will be available across the country. So, just what is in Ben & Jerry’s next “limited batch” of ice cream that carries Bob’s name? That would be banana ice cream with caramel (9 percent) and cookie (6% percent) swirls and chocolaty peace signs (4 percent). What could be better than such an ice cream? That would be an ice cream that has a portion of the proceeds from all sales supporting the One Love Youth Camp, an annual camp that helps promote youth empowerment and social change in Jamaica. It all just tastes good.